And AnnaTheRed, full-time "plushsmith" at Castle Crashers studio The Behemoth, set about rendering this adorable concept in huggable, tongue-lolling form. 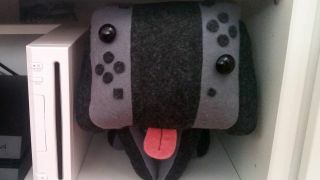 I'm definitely going to think of a little wall-eyed doggie every time I see a Switch now. And I'm definitely going to feel unnerved the first time I pop off the sides of that pup's head so I can play with it on the go. This metaphor was bound to get weird at some point.